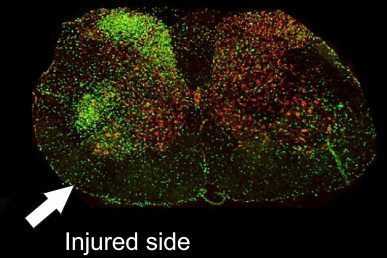 A growing collection of anecdotal stories raises the possibility that nerve injury in an arm or a leg can act as a trigger for the development amyotrophic lateral sclerosis, or ALS — a progressive neurodegenerative disease also known as Lou Gehrig’s disease, named after the famous New York Yankee who died of it in 1941. The connection between ALS and athletes runs deeper than a single ballplayer; people who engage in intense physical activities, such as professional athletes and people in the military, are more likely to be affected by ALS. In some, the disease seems to start after an injury — muscle weakness at the site of the injury slowly spreads to new areas until weakness in the muscles responsible for breathing causes suffocation. “We know that in some patients with ALS the weakness starts in a hand or leg, and the disease spreads. Coincidentally, the patient will describe a recent or remote injury to that same hand or leg that matches the location of their disease onset. We wanted to study how environmental contributions, such as a focal nerve injury, affects how the ALS starts and spreads,” said Dr. Jeffery Loeb, the John S. Garvin Endowed Chair in Neurology and Rehabilitation in the UIC College of Medicine and corresponding author of the paper. “This raises an important question of the relative contributions of environment versus genes or nature versus nurture,” Loeb said. “This chain reaction of cell death could be what causes the progressive spread of muscle weakness we see in ALS,” Loeb said.